What Day Of The Week Is May 12? 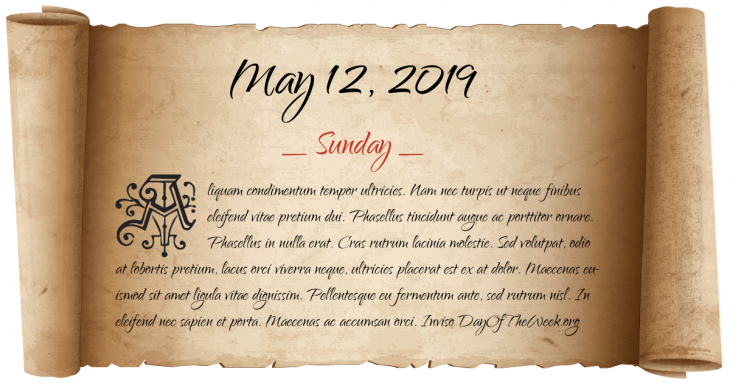 May 12, 2019 is the 132nd day of the year 2019 in the Gregorian calendar. There are 233 days remaining until the end of the year. The day of the week is Sunday. American Revolutionary War: In the largest defeat of the Continental Army, Charleston, South Carolina is taken by British forces. American Civil War: the Battle of Spotsylvania Court House: thousands of Union and Confederate soldiers die in “the Bloody Angle”. Oscar II is crowned King of Sweden. George VI and Elizabeth Bowes-Lyon are crowned King and Queen of the United Kingdom of Great Britain and Northern Ireland. Austria regains its independence as the Allied occupation following World War II ends. A formal North American Aerospace Defense Command agreement is signed between the United States and Canada. Who were born on May 12?